During the past decade, social media have played a major part in the news coverage of large-scale humanitarian disasters, by reporting in real time the stories of the rescuers and the rescued. This was clearly evident during the 2010 Haiti earthquake and the nuclear leaks at Fukushima in 2011. Sixty years ago this month, long before the Internet was invented, Greece was devastated by one of the most powerful earthquakes Europe had ever experienced. The following comments are devoted to the Israeli Navy soldiers, who went on a mission to rescue the residents of the Greek islands. In August 1953, Israel had just concluded celebrations of the country's fifth anniversary. The festivities weren't joyful: An economic recession and military threats were causing no end of anxiety to the country's leadership. The country was also preoccupied with the task of absorbing waves of immigrants, who had come from Arab lands and post-Holocaust Europe. Israel's international position was also precarious: On the one hand many countries had recognized the newly founded state, but on the other hand their leaders refrained from paying official visits because of the Arab boycott. A number of European countries had not yet recognized Israel, among them Germany, Austria, Ireland, Portugal, Spain, and Greece. The Israeli Navy was in the process of building its force, having at its disposal only a small number of old frigate-class warships, which had been renovated and put into service, along with a mixed assemblage of young soldiers lacking experience or naval training. On Aug. 12, 1953 the navy flotilla was on its way back to Israeli shores, after four weeks of intense training in the Aegean Sea, aimed at creating a professional naval force. Suddenly S.O.S alerts were sounded off the Greek shores: A series of deadly earthquakes, measuring 7.3 on the Richter scale, had struck the area of the Greek islands, Kefalonia, Zante, and Ithaca. The commander of the Israeli flotilla reported back to naval headquarters in Haifa and requested permission to turn back and offer aid. The Israeli response was immediate: "Enter and provide assistance." The Israeli fleet, 15 hours away from the site of the disaster, doubled back and sailed past the American and British fleets, which could not access the areas on the islands that had been hit, due to the immense size of their warships. "huge clods of earth were falling into the water at tremendous speeds, the summit of Mount Ainos on the island of Kefalonia looks as though it were split in two, pillars of smoke rising from cracks could be seen throughout the town, and fierce fires had broken out in the olive oils storerooms and were burning all that remained...in most of the island's village not a building remained standing, and thousands were wounded in critical condition, among them pregnant women, old and young, people with amputated and crushed limbs, and all were in need of immediate help....the casualty clearing station was located on a wharf of the island's central port, the flotilla's senior physician, Dr. Ashkenazi, along with his younger colleague, Dr. Seelenfreud, were in charge of medical treatment, distributing the limited medical resources, and performing triage. 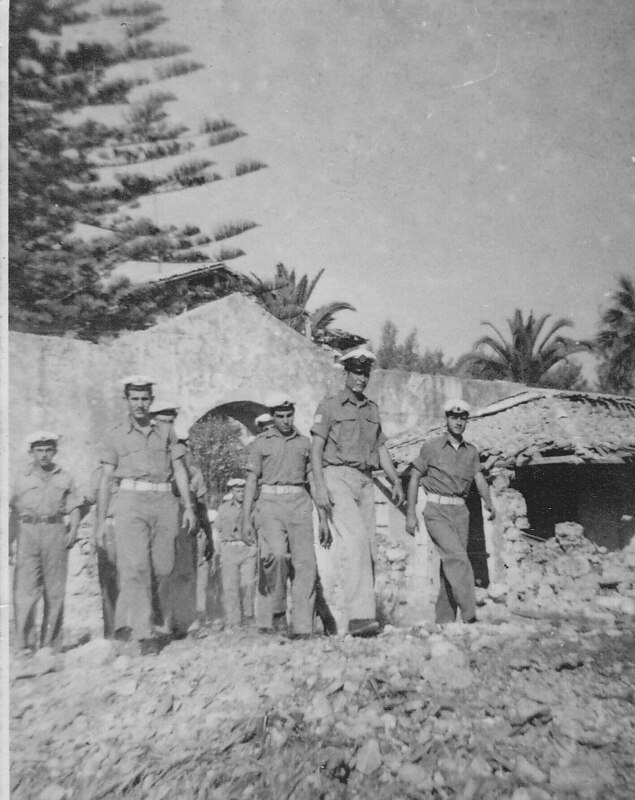 The Israeli teams performed emergency surgeries: a broken pelvis, skull fractures, premature births, complex fractures, hemorrhages, panic attacks, despair, and havoc everywhere..."
According to the Law of the Sea of that time, the first rescue force to arrive on the scene takes command of the operation, and since the Israeli navy was the first to land on the shores of Kefalonia it took charge and also directed the rescue operations of the American and British fleets. 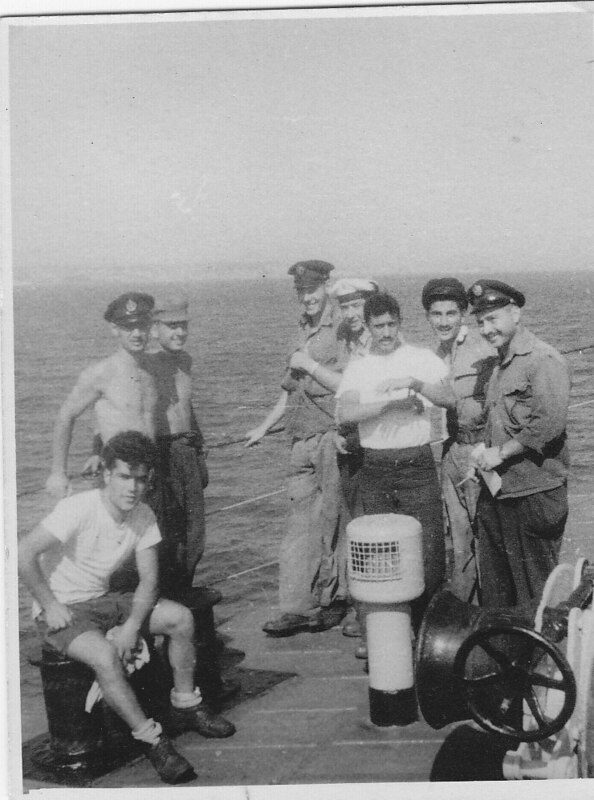 For three days and nights the 450 Israeli naval men struggled side by side with the Americans and the British to provide relief to the residents of the Greek islands, saving hundreds from a sure death, transporting 400 seriously wounded casualties to the mainland, and providing medical assistance to 16,000 local residents. Although at the time the Greek government had not yet recognized the state of Israel, and official recognition would arrive only 37 years later, the Greek people expressed their gratitude. 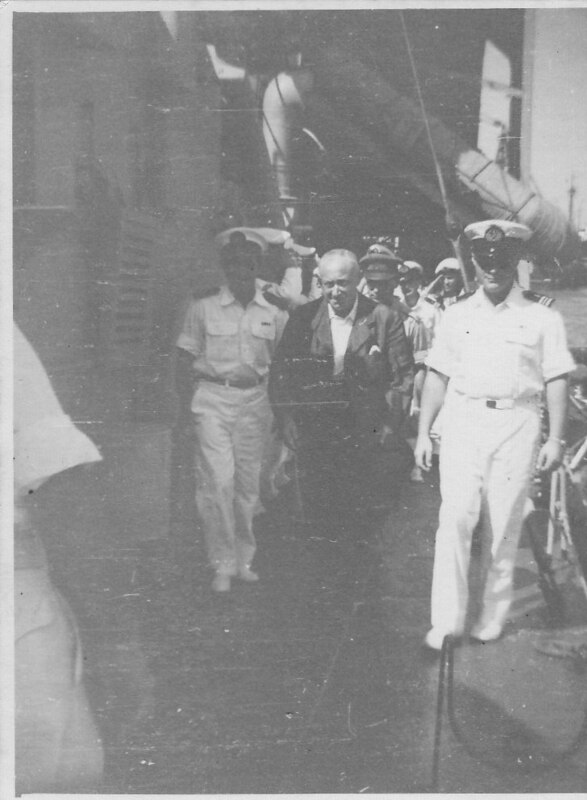 The king of Greece came personally to greet the Navy soldiers to convey a message of thanks to David Ben Gurion, Israel's Prime Minister, and to award badges of merit to the commanders of the operation, Shlomo Harel and Yizhak Dviri. In an act of appreciation for the Israeli navy, the Greek press called it "the fleet of love and hope," and "the Israeli sailors of salvation." As the Israeli fleet departed from the Kefalonia bay to make its way back to Israeli shores, the other ships that took part in the rescue operations sounded their horns in a prolonged cheer, in a spontaneous show of professional homage. This month, the Ambassador of Israel to Greece Arye Mekel received on behalf of the Israeli Government a certificate of honor from the local authorities as a gesture of appreciation for the events that took place 60 years ago. It was the first act of Israeli humanitarian aid operation in a disaster zone. 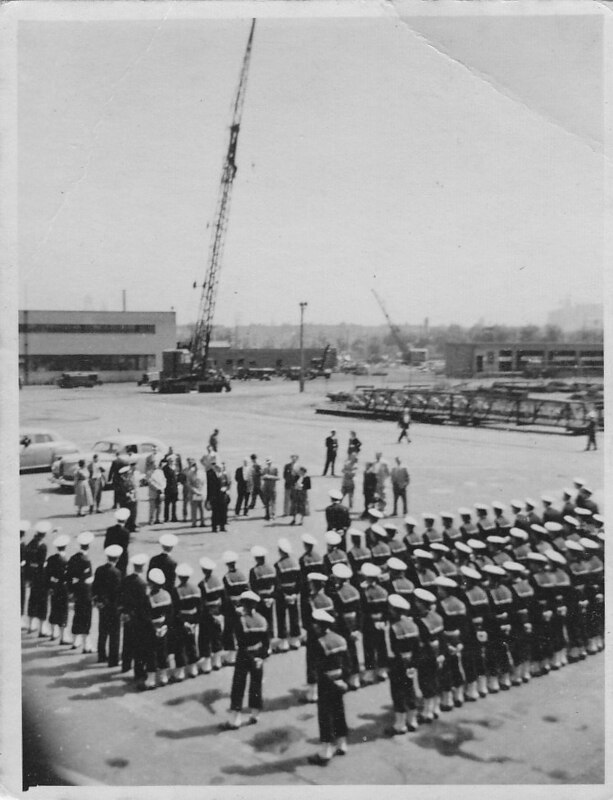 The heroism of the Navy soldiers laid the foundations for a long tradition of Israeli humanitarian aid operations, used as a Public Diplomacy tool, as witnessed many years later in Japan, Haiti, Turkey, and many other places. 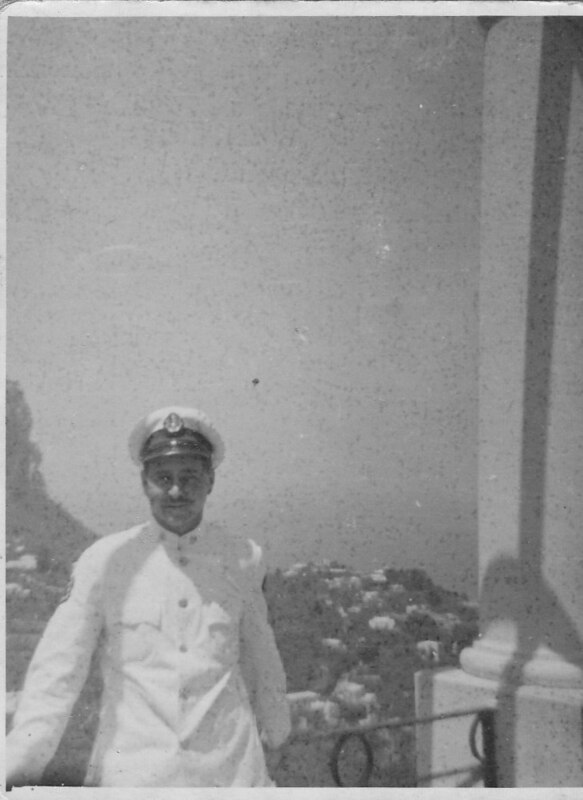 One of the commanders serving that mission was my late father Eliyahu Saranga, who participated as a junior commander aboard the Israeli warship INS Misgav (K-30). 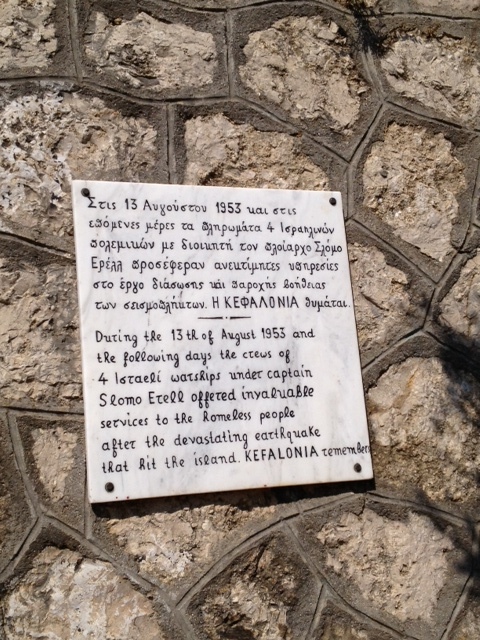 Honorary plaque for the Israeli Navy in the center of Kefalonia Island.